(Washington Post) – Americans love to designate dietary devils. MSG. Fat. Carbs. Gluten. The latest food to be nominated for devilhood is fructans. And the focus on them came about, in part, because of our obsession with gluten. Here’s how: We know that many people who follow a gluten-free diet don’t need to for medical reasons, such as having celiac disease. Yet some insist they aren’t going gluten-free because it’s trendy — they’re going gluten-free because it makes them feel better. Many researchers believe these people who think they can’t tolerate gluten are actually sensitive to fructans. Humans have limited ability to digest fructans in the small intestine. That means they’re still intact when they reach the large intestine (colon), where gut bacteria break them down. In some people, this fermentation creates excessive gas and bloating, and sometimes diarrhea. Avoiding these symptoms means limiting daily intake of fructans, although the answer to “how much is too much” varies from person to person. 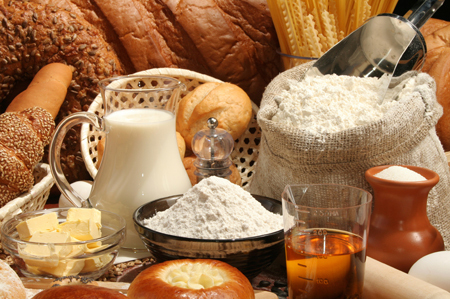 When you consider that wheat is a major source of gluten (a protein that helps make dough elastic), and also contributes about 70 percent of the fructans in the American diet, it’s easy to understand why someone who feels better after eliminating wheat might conclude that they’ve identified a gluten intolerance. However, avoiding wheat and other gluten sources when fructans are the culprit is an incomplete solution, because symptoms will probably occur when other fructan-rich foods are eaten. One difficulty with diagnosing food sensitivities is that the food components that provoke them don’t exist in isolation. They are part of a complex matrix with numerous other food components that could potentially cause an adverse reaction in some individuals. For most people, wheat is a nutritious food. But for the minority who react to wheat, any one or more of the grain’s many components — not just fructans and gluten, for example, but non-gluten proteins — could be the culprit. A second difficulty is that, unlike with celiac disease and wheat allergies, there is no scientifically valid way to test for most food sensitivities. People with celiac disease need to avoid gluten, which is also found in rye and barley, and people with wheat allergies need to avoid wheat, but people with what is termed as non-celiac gluten/wheat sensitivity are in a dietary gray area. A group of researchers from Norway randomly assigned 59 people, who did not have celiac disease but were avoiding gluten because they thought they had a gluten sensitivity, to eat baked muesli bars containing gluten, fructans or neither — the placebo bar — for seven days. The study was double-blind, so neither the participants nor the researchers knew which bars were which during the active portion of the study. The results, published in February in the journal Gastroenterology, showed fructans were actually more likely to produce symptoms than gluten: Thirteen participants experienced the worst symptoms after eating the bars with gluten, while 24 reported feeling worse after eating the fructan-rich bars. Interestingly, 22 said the placebo bars bothered them most. So how can someone find out whether they’re fructan intolerant? Breath testing is one possible option, but its reliability is uncertain. Some people have luck with eliminating all dietary fructans for a few weeks, then, if symptoms go away, adding back non-wheat sources of fructans. If symptoms return, it’s likely the fructans, not wheat. This is where seeking the guidance of a dietitian who is experienced with food intolerances is helpful, especially because fructans are one of many types of dietary carbohydrates that may cause symptoms in people with irritable bowel syndrome (IBS). Like fructans, fructose, lactose and sugar alcohols such as sorbitol and xylitol, are highly fermentable in the large intestine, leading to gas, painful bloating and diarrhea, constipation or both. These carbs are collectively known under the acronym FODMAPs — fermentable oligo-, di- and monosaccharides and polyols (fructans fall into the oligosaccharide camp). Rather than avoiding a whole class of food, it’s better to determine exactly which food components — and their hidden sources — you need to eliminate to stay symptom-free. The ultimate goal is to enjoy as varied a diet as possible.